During spring break 2010, our friends Mark and Emma flew from Michigan and we took the Baja over to Death Valley National Park. When we bought the Baja, it had no rear seat bench, so we had to acquire one so that all four of us would fit in the car! It was a tight squeeze, but we all fit inside, and had room for a little bit of stuff inside, like food and water. We had a roof rack, so thats where we put all of the camping equipment like our tents, sleeping bags, clothes, etc. We also carried spare tools and a few spare parts that came in really handy, and a spare tire. 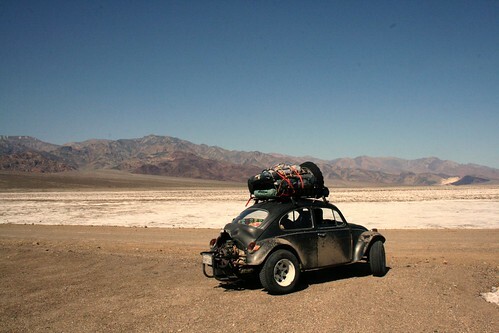 The Baja at Badwater Basin, Death Valley. During our trip to Death Valley National Park, we mainly camped in the wilderness areas of the park which we got to by driving on the 4x4 roads. We never stayed at an official campground, which was great, because most of them were designed for big RVs only. Most of the official campgrounds were gravel parking lots with huge RV spaces and big convenient bathroom buildings. We preferred driving off-road (on 4x4 roads, not literally off road - that isn't allowed in the park) and finding a camping spot in the wild. We had to pack in all of our own water, which we stored in a 7 gallon jug, and all of our food and, of course, toilet paper! 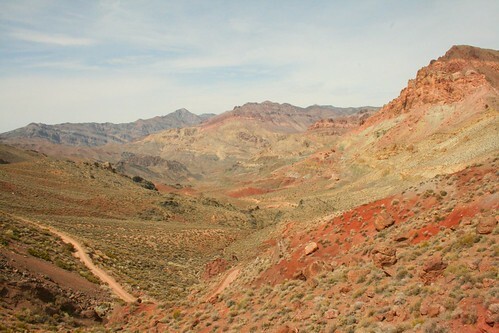 It sometimes felt like we were prospectors in ancient times, exploring the canyons and washes. Finding our first camp spot on a wash. The first night, we camped near Stovepipe Wells on a wash that was on the road to Cottonwood Canyon and Mosaic Canyon, before the road split. It was peaceful and warm. The silence was heavy and so unusual to 'hear' nothing, not even the wind. We had a beautiful sunset which painted the few clouds overhead a deep red, like the sky was on fire over Death Valley. 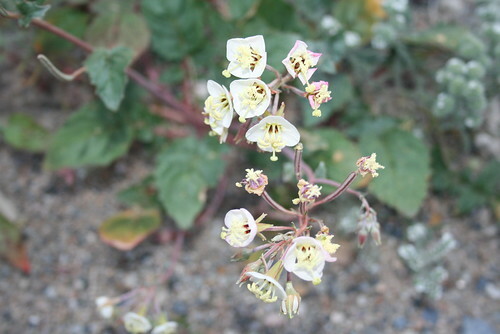 A few early wild flowers were already blooming from what seemed like dry concrete-like sand. 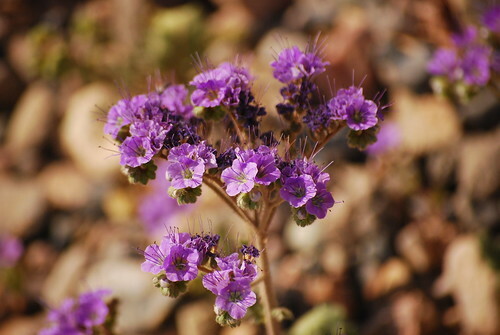 The next day we went hiking in the Darwin Falls area, near Panamint Springs. In some of the dry desert canyons there a cold springs, which bring water to the surface and allow plants and cottonwood trees to grow. 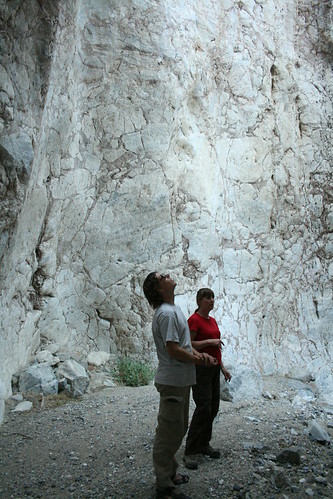 There is a HUGE underground aquifer underneath Death Valley which was only recently discovered. We drove off road on a 4x4 road called Zinc Hill, that took us to upper Darwin Falls Canyon (not sure if thats the real name or not) and found a rim and tire that actually fit the Baja! What are the chances that we would find a 4 lug VW rim and tire sitting around in the desert? We quickly snatched it and attached it to the roof rack. When we reached the end of the road at China Garden Springs, we started our hike to see Darwin Falls, which we never ended up seeing because we took the high trail instead of the one that stayed in the canyon floor. Oh well, we had great views anyways. When we came back, Emma found koi fish that lived in the pool at China Garden Springs! Driving on the craziest road - Zinc Hill! We found that tire on the roof on the side of the road! 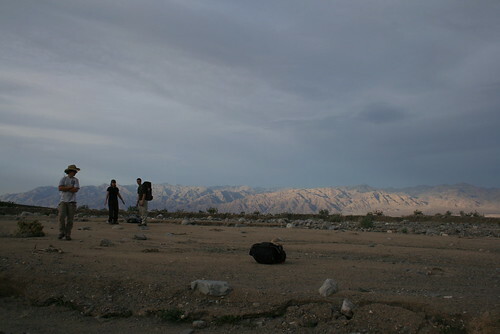 The next night we camped out on the side of an alluvial fan to the west of Badwater Basin at the foot of Telescope Peak. We had a rough night with a non stop howling wind which blew dirt into Mark and Emma's tent, and was so strong it permanently bent the aluminum poles of our tent (not that bad though). We had probably about one or two hours of sleep that night max! Not wanting to repeat that again, the next night we went back into Cottonwood Canyon and drove a couple miles into it until we reached the narrows and found an awesome secluded camping spot, also on a wash. Because it was spring, there was actually grass growing in the desert! Arriving at our campsite in Cottonwood Canyon. 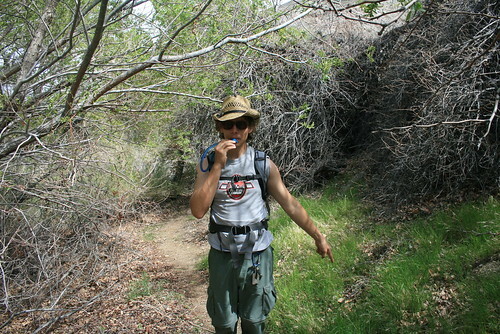 We hiked in the area around our campsite and found a small canyon that off-shooted from Cottonwood Canyon. We thought there might be narrows, so we hiked into its mouth and it kept getting thinner and thinner until the canyon dead ended with a wedged LARGE boulder blocking our path. The only way around it was to climb over it, but it was about 15 feet tall and really smooth. So we boosted Romy over the boulder and he explored the canyon further. When he came back he said it turned into some awesome narrows, so we ran and got the tow strap from the Baja and used it as a climbing rope. All of us shimmied up the tow strap and continued hiking through the narrows, which were formed out of tall and narrow rock which had been polished smooth from eons of silty rainwater that flooded the canyon. I think we even saw some charcoal drawing up on the rock, but we weren't sure how old they were or who drew them. The secret Narrows we found off Cottonwood Canyon. A few days earlier, we heard from the rangers that Titus Canyon Road was open, which was supposedly a very scenic drive on a well graded dirt road through Titus Canyon. Since we were camping in our secluded spot for a couple nights, we took the opportunity to drive the Baja un-loaded through Titus Canyon the following day. We had to exit the park and go into Nevada to get to the entrance of the road (it was one-way). The road winded through many colorful canyons, and then to an abandoned ghost town called Leadfield which was only a city for one whole year. It was a bunch of shacks on a hillside. But we saw on a documentary that there is a mine there which has rock-eating organisms that live in the absence of sunlight deep in the cracks of the hillside. It is closed to the public and only scientists can go inside. We didn't know that when we were driving through. The hills were so colorful. 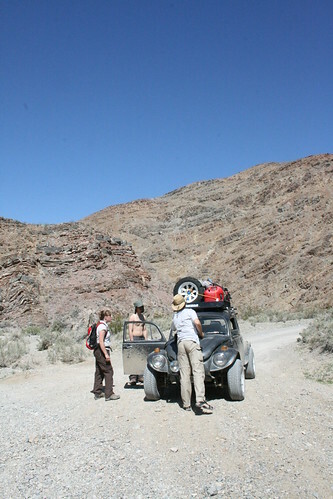 When we got to the mouth of Titus Canyon, we took a lunch break in the wash. 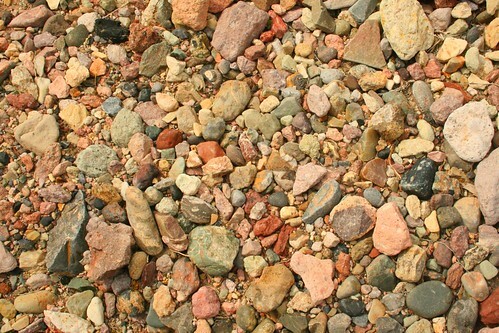 There were rainbow rocks strewn all over the place. Rainbow rocks in Titus Canyon. 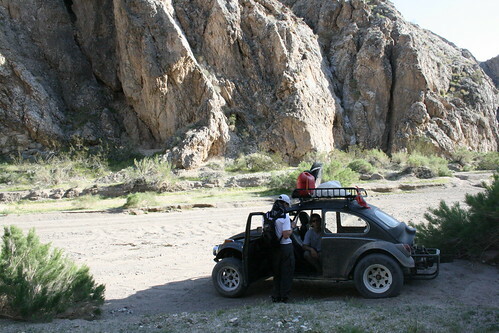 Emma and Romy and the Baja in Titus Canyon. 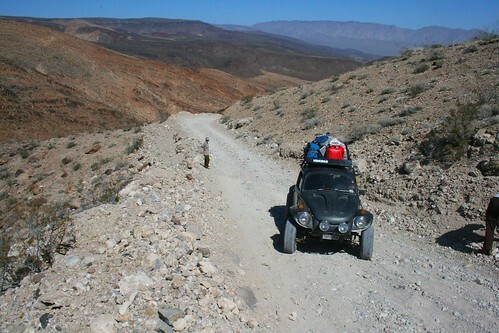 We drove the Baja slowly, not because the road was bad, but because there was so much to see. The canyon, which started out wide, got really narrow. We stopped many times to climb on the rocks and see the flowers that were in bloom. 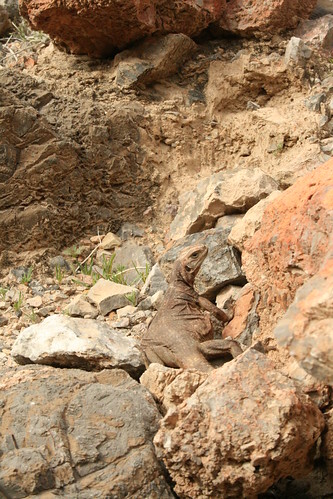 I spotted some huge lizards sunning themselves on rocks. They were very well camouflaged, that you could only see them if they moved! Can you see the lizard!? Soon we were out of Titus Canyon, and heading back to our campsite in Cottonwood Canyon again. We got back later than expected, so we just relaxed that night instead. Interesting story as we were driving back to the camp - we got flagged down by some other campers down the wash. . . they gave us a 'gift' that kept on giving all night. 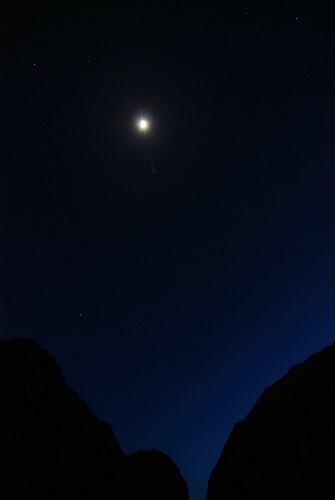 The moon illuminating our canyon. The next morning, we hiked further down the canyon to Cottonwood Springs, a set of three springs that gave the canyon its name. 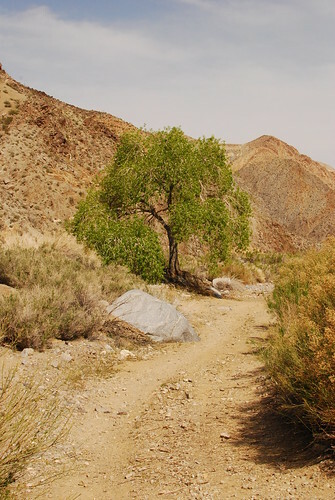 As we walked down the barren canyon, all of a sudden we saw a lone cottonwood tree. Then around the bend a forest of them emerged! It was so lush, that there was even grass growing and birds singing - a true oasis! And there were a lot of the laziest crickets in the world. They crawled around without any cares under the dense covering of grass and fallen cottonwood leaves. Grass and trees in the desert! The lone cottonwood tree in the desert. After the hike, we moved on out of the canyon and out of the park. 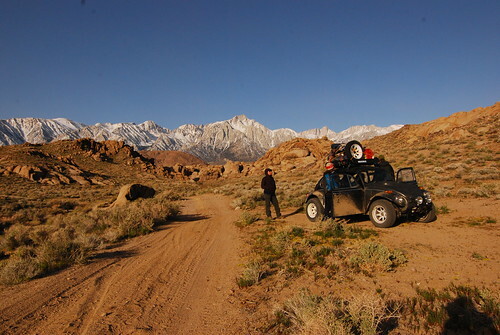 We had to start heading home, so we decided to camp somewhere near Lone Pine, CA that night. We remembered that there was some BLM land called the Alabama Hills just west of the town, so thats where we headed. We got there after dark, so we set up camp with the Baja's head lights shining, but the moon was pretty bright too! The snow on the Sierra Nevadas was reflecting the moonlight so well, we could literally see the climbing route that Romy and I attempted a year or so earlier to the top of Mt Whitney at midnight! The next morning, we saw our campsite in the full light and it was so nice! I love those times when you wake up and realize what a cool spot you're in! Camping in the Alabama Hills underneath Mt Whitney.